Not again! I chalked up another loss as I got stopped out on this short USD/CAD day trade of mine. As you can see from the chart below, price broke above the falling trend line on the 1-hour chart and reached my stop at .9920. I probably should’ve moved my stop to my .9880 entry when I saw that the trend line was holding for a bit. That way, when the pair suddenly rallied later on, I could’ve gotten out at breakeven. Maybe I should’ve simply stayed on the sidelines since it seemed that dollar pairs have been acting a little cray-cray these days, with all the fuss about the Beige Book, Bernanke’s Jackson Hole speech, and speculations of QE3 for the next FOMC meeting. What else do you think went wrong with this trade? I could really use your feedback on this one! Thanks! I’m in! Just after I posted my trade I had a gut feeling that USD/CAD will find it hard to reach the hard .9900 level that I was aiming for. And since the best traders pay attention to their gut feelings (which is different from impulse, by the way), I decided to put a sell stop order at .9880 in case the pair doesn’t hit .9900 and goes down without me. Unfortunately for me, the pair went to trigger my sell stop order before high-yielding currencies spiked down across the board and USD/CAD just touched .9900. Imagine what I felt when I saw the chart! It’s like spotting the perfect pair of shoes only to find out that they don’t have a smaller size. Settling for another pair of shoes is not the best feeling, I tell ya. Good thing that price is going my way! Not a bad trade, eh? I’m keeping my fingers crossed that it reaches my original profit target! What do you think of my plan? Should I take profit now, or wait for a few more hours? Oh, and who here has ever tried to use sell stop orders? Care to share? Hope you’re having a good time trading! Thanks to the success of my latest AUD/USD day trade, I’m taking another short-term setup. This time, I’m trading USD/CAD because I’m diggin’ how the signals line up on its 1-hour time frame. As you can see, there’s a falling trend line connecting the pair’s recent highs, suggesting that the pair is in a downtrend. After the pair found support at bottom WATR, it seems to be retracing towards the .9900 area, which could act as resistance. You see, that level is right in line with the trend line and week open price, and it’s also around the 61.8% Fib level! To top that all off, there’s a pretty good bearish divergence forming with Stochastic making higher highs. I decided to be a tad more careful though, as I plan to jump in only when Stochastic starts to cross down from the overbought region. As for fundamentals, I’m betting on U.S. dollar weakness, at least for the days leading up to the Jackson Hole Summit. After all, the most recent FOMC meeting minutes revealed that the Fed is mulling further easing since U.S. data hasn’t been on the up and up lately. This was confirmed by the weaker than expected U.S. CB consumer confidence figure released yesterday, which triggered a sharp dollar selloff. I’m inclined to think that the Fed’s Beige Book will more or less show signs of bleak activity in the U.S. economy, which could fuel QE3 speculations again. Since the U.S. dollar is moving to the tune of fundamentals these days, a downbeat Beige Book report could send USD/CAD back south. I’ll be aiming for the bottom WATR, which is in line with the previous week low and the .9850 minor psychological support, as target for this day trade. I’ll set a tight stop above the week open price and falling trend line. 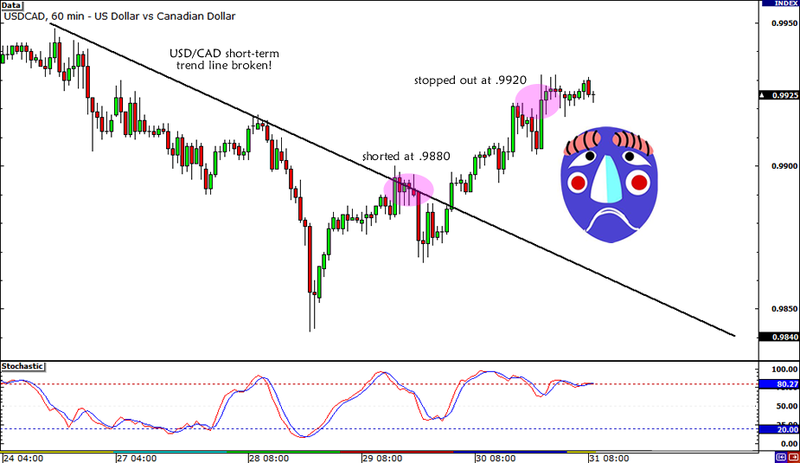 Short USD/CAD at the 61.8% Fib area or .9900 once stochastic crosses down, stop loss at .9930, pt at .9850. I’ll be risking only 0.5% on this short-term play and if you plan to join me, make sure you look at our risk disclosure first! Depending on my entry price, I could be looking at a potential 2:1 reward-to-risk on this trade. Do you think I’ll be able to bag another win this week? You know where to reach me!